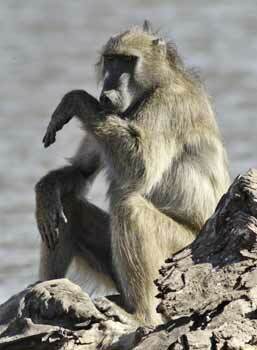 Baboons are fascinating animals but don't get the attention they deserve. 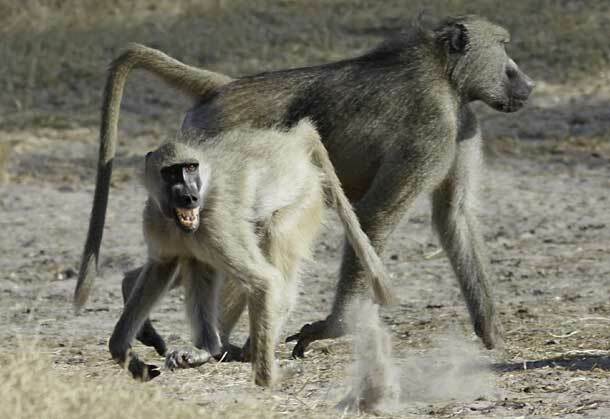 When you're on an African safari, chances are you'll be viewing the wildlife from a game drive vehicle that you share with others, under the control of a safari guide/driver. 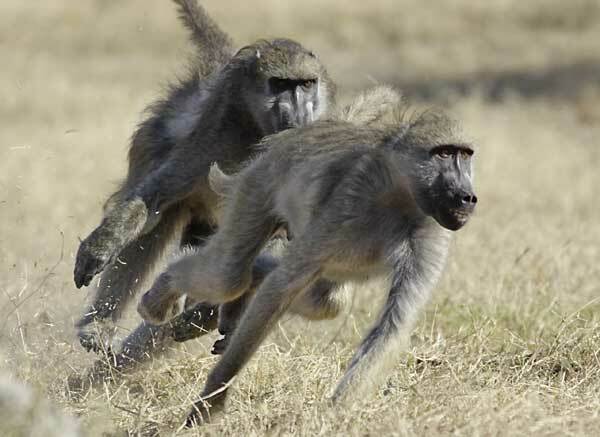 The guide knows that most guests want to see the more glamorous wildlife, so less spectacular animals like baboons and monkeys tend to be neglected as you drive past, always in hope of seeing something more exciting further along the track. On a recent visit to Hwange National Park in Zimbabwe, we opted to spend a couple of hours parked at one of the many pans in the park where we watched elephant, buffalo, giraffe, and zebra coming down to the pan to drink. 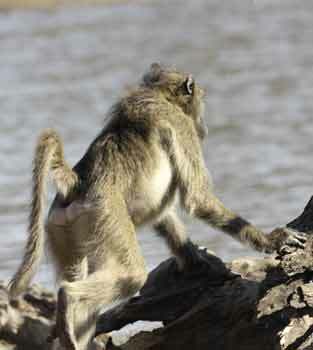 During this coming and going, a troop of chacma baboons arrived. They reminded me of a noisy, unruly extended family - from grumpy old men, bickering aunts, strutting fathers to cheeky kids and know-it-all adolescents. 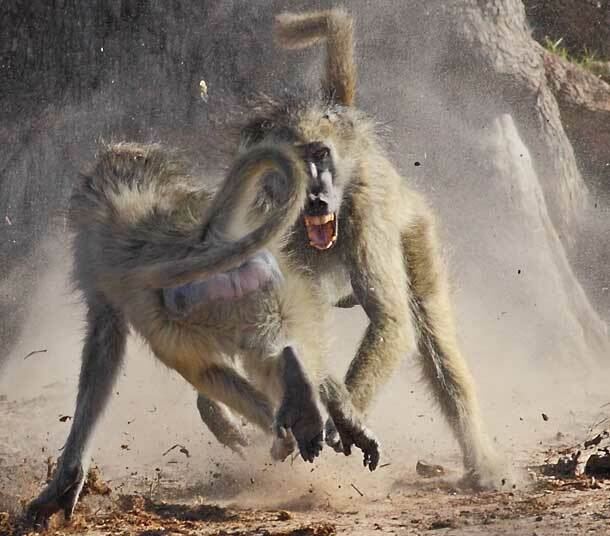 What struck me in particuler were the frequent squabbles, skirmishes, and chases between members of the troop, as the pictures below illustrate. 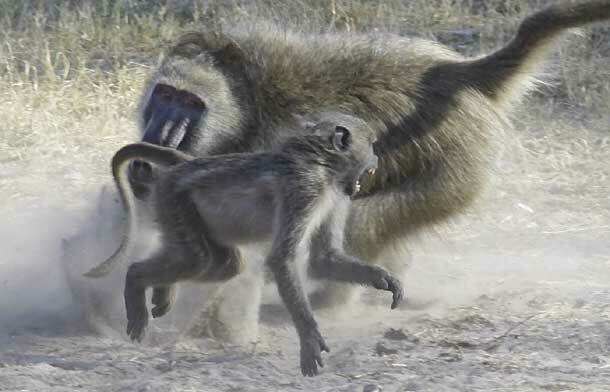 "The frequency and intensity of aggression in a baboon troop vary greatly, largely as a result of troop composition and relationships between individual males, in particular. 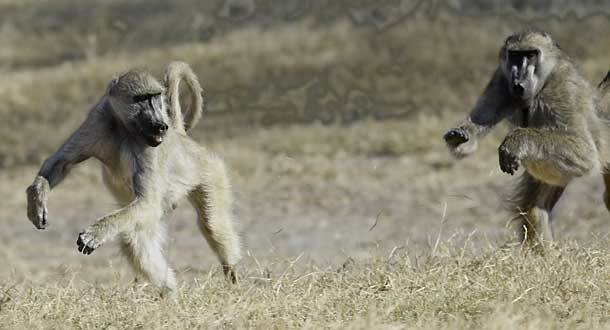 If the rank hierarchy is well established, dominance is asserted and acknowledged with little or no overt aggression. But troops with recent male immigrants or newly matured resident males tend to be unstable." He goes on to explain: "Even in stable troops, practically any disturbance, internal or external, is apt to provoke disciplinary action by dominant males. 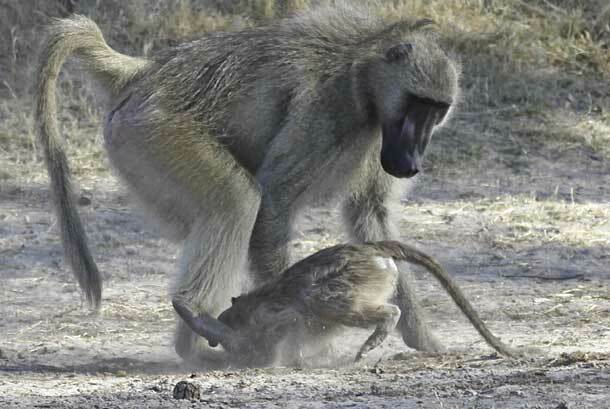 Teasing or bullying of small baboons by older juveniles and squabbles between females frequently trigger chases punctuated by shrieks, barks and roars. 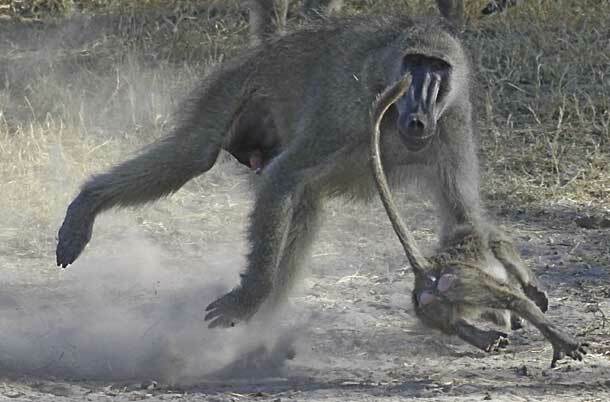 If a male catches his victim, he may seize it, beat it with his hands, rub it on the ground, bite it in the neck, and even pick it up in his jaws. 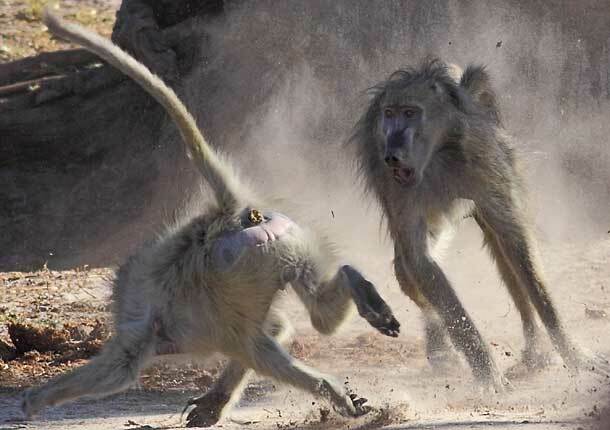 Estes says that, "despite their apparent ferocity and the disparity in size, such attacks rarely last more than a few seconds or result in visible injury". That was certainly the case on this occasion, with all the chases and skirmishes ending quickly with no apparent harm done. 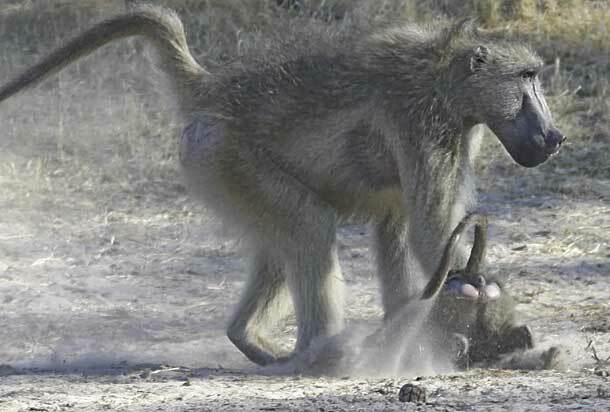 And, in between the bursts of frenetic activity, the troop carried on doing what baboons do - grooming each other, foraging for food, and crouching down to drink from the pan (below).